Chocolate Berry Cups – Homemade dark chocolate cups are filled with fresh berries and topped with a drizzle of dark chocolate. A healthier way to get your chocolate fix any time of the year! Okay I just can’t take it anymore…I gotta post a chocolate recipe. I just gotta! I don’t care if Valentine’s Day is weeks away. Just bookmark this for future reference, k? Last year, I posted this chocolate raspberry mousse recipe, where I talked about my obsession with raspberry and chocolate. It’s one of my favorite combos EVER. So much so that I also made this raspberry hot chocolate this past December. Remember that one?? Well, get ready cuz I’m back with yet another raspberry and chocolate treat. But this time it’s not just raspberry but also blackberry and blueberry. Today’s recipe is for my Chocolate Berry Cups! Check them out! Almost too beautiful to eat, right?! ALMOST. The inspiration from this treat comes from chocolate cups I used to regularly get at a chocolate shop whenever I went mall shopping. Since I rarely go to the mall nowadays – anyone else in the same boat? – I decided to make these babies at home. Plus, these cups were made with just chocolate and berries so surely I could make them at home and save myself the $8, right?! To make these cups, I needed to buy a good mold. I’ve tried making chocolate cups in cupcake liners and I’ve failed every time. So I wanted to get a silicone mold to help me out this time. I absolutely love this one from Amazon. It was the perfect size and was super flexible so I could take the cups out without destroying them. Plus, I can use it to make mini tarts in the spring! Make sure you are using melting chocolate. It hardens up perfectly after it’s cooled and will stay shiny and sturdy. I buy the melting disks from Ghiradelli at my local grocery store. Works every time! Do not use the berries if they’re still wet from being rinsed. Let them dry all the way so the excess moisture doesn’t ruin the chocolate. An easy way to get chocolate into a sandwich bag for drizzling is to place it into a small cup to hold it in place while you pour. Just make sure the top of the bag folds over the edges of the cup so it’s locked in. Make sure you’ve coated the edges of the mold with as much chocolate at possible. I know it will drip down the sides, but it will begin to catch once the chocolate starts to cool. If the edges are too think, the chocolate cup will break apart when you try to remove it from the mold. And last but not least…if the cup crumbles a little when you remove it from the mold, it’s not a lost cause! As long as it can still hold the berries, I say use it! But if it’s broken beyond use, just melt it again and start over. Homemade dark chocolate cups are filled with fresh berries and topped with a drizzle of dark chocolate. A healthier way to get your chocolate fix any time of the year! I highly recommend the use of a silicone mold for these chocolate cups. See notes below for a link to the one I used. Wash and dry your mold and set aside. Place chocolate disks in a medium microwave safe bowl. Microwave for 30 seconds. Stir and then microwave again for 30 seconds. Repeat until all chocolate is melted. Place about 2 ounces (4 tablespoons) of melted chocolate into plastic sandwich bag and seal. Set aside. Spoon about 2 teaspoons of melted chocolate into one mold. Brush chocolate to the edges using a pastry brush until the whole mold is covered in chocolate. Make sure the edges are loaded with as much chocolate that will stick in place. The edges are delicate so we don't want the chocolate layer to be too thin. Repeat with other 11 molds. You may need to reheat chocolate to melt it again. Reheat in 15 second intervals. Once all molds are filled, place in freezer to chill the molds for 10 minutes. This will solidify the chocolate. Remove solid molds from the freezer. Push the chocolate cups out of the mold from the bottom, being very very gentle, to release the cup. It's okay if the edges aren't perfect but you don't want the whole thing to crack. Fill each mold with an assortment of berries. Grab the sandwich bag filled with chocolate. Snip a corner off the bag and then drizzle chocolate over each cup. Refrigerate until chocolate has hardened again. Serve within the next couple of days, or before fruit goes bad. Refrigerate leftovers. Hi! Is it okay to make the chocolate molds a week in advance? Also is there a particular pastry brush you recommend? I am making these for my daughters bridal shower and am very Nervous about attempting this. Have never melted chocolate in my life let alone made molds lol! Thank you s much for your help!!! I love a good recipe that looks as fancy as this but keeps ingredients to a minimum! I have a party coming up that I need to take these to! I’m obsessed with this idea!! I love that it’s so pretty, and with the fresh fruit it’s a healthier sweet. So smart! This might just be our Valentine’s Day dessert. Thanks for the great idea! Fruit desserts are always my favorite, and the simple chocolate shell really takes fruit salad up a notch. Gorgeous presentation and just a little chocolate makes it an extra special dessert! Yes, yes, and yes! Thanks so much for the positive feedback! What a gorgeous treat! This looks incredibly tasty! I can’t wait to try your recipe! I love how easy this is to make, yet so elegant! How clever! I love these little cups, what a great gift idea for anytime of the year or a sweet little treat for me too! Since it has fruit, its healthy right? Of course it’s healthy! And the dark chocolate makes it even better because of the antioxidants! Chocolate + berries is seriously one of my favorite things in the world – and these are just so pretty, I couldn’t say no! 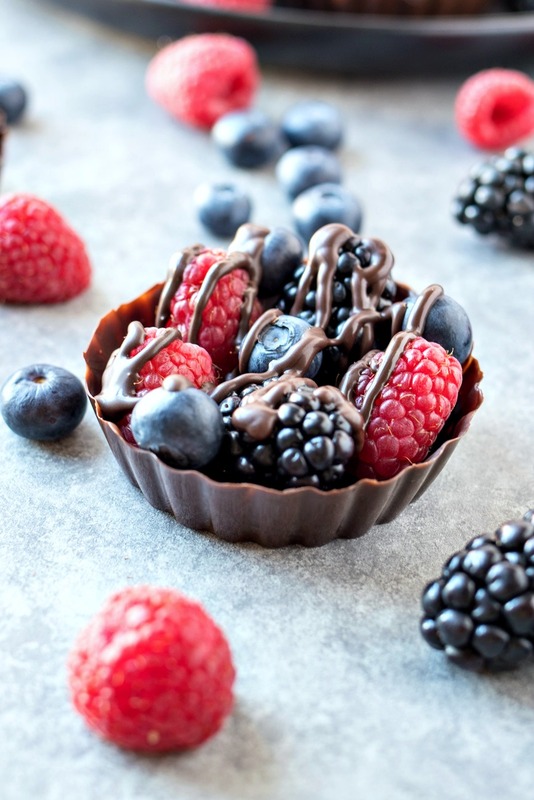 These chocolate cups look beautiful with berries! Wonderful healthy treat! These are so simple and so gorgeous, thank you for this yummy recipe! Such a great idea and so pretty! I’m saving these for my next dinner party! Well don’t these look delicious. Silicone molds are a MUST for something like this. I have used them in chocolate recipes before. Work like a charm. I would devour a few of these at a time. They are healthy right? I mean they do have berries. These look like my version of heaven right now! I love berries paired with chocolate. Sooooo good! Oh my gosh! I want these right now! I could NEVER make these for sure. But they rare SOOOOOOOOOOOOOOOO good and gave me a great idea for desert. Thanks. Aw don’t say that! These are much easier to make than you think! These are gorgeous! As a chocolate fiend, and as a berry-lover, too, I think I could eat the whole batch!